Artistic Support Material for Hyperrealia project. A collection of realia from the State Library of Victoria. 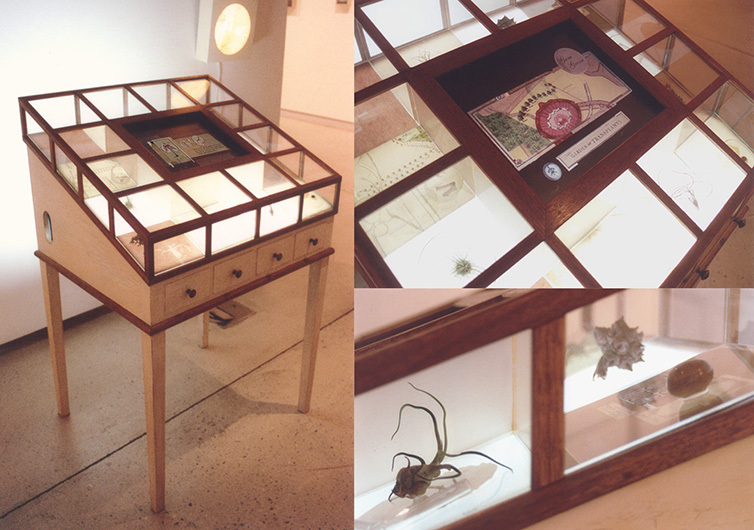 An interactive animation housed within a 19th Century style botanist’s cabinet. Comprising both artefacts and a touchscreen installation, the work allows the viewer to engage with a digital interactive titled, Garden of Transplants. A collaborative project with Chris Henschke. Explores the relationships between digital interfaces and preceding technologies of display. Assembled crystal cave dioramas, exhibited at The Narrows, Melbourne. An exploration of hybrid media and the juncture between arts and sciences. Image from an experimental cut-out style animation titled, Botanical. Installation at The Atrium, Federation Square. An interactive narrative, that meanders through a garden inhabited by strangely mutated and unnatural organisms rendered in the style of the colonial botanist.